Paperback king, Aditya Kapoor’s life is straight out of a modern man’s fantasy. His literary stardom is perfectly balanced by a loving wife and a spectacular career. With everything he touches turning to gold, Aditya is on a winning Read More.. Description Paperback king, Aditya Kapoor’s life is straight out of a modern man’s fantasy. His literary stardom is perfectly balanced by a loving wife and a spectacular career. With everything he touches turning to gold, Aditya is on a winning streak. Shreya Kaushik is a student with a heart full of ambition. Young, beautiful, and reckless, Shreya speaks her mind and obsessively chases after what she wants. And what she wants is to be a bestselling author. What happens when their worlds collide? Is it possible to love two people at the same time? Can real ambition come in the way of blind passion? Can trust once broken, be regained? Master storyteller Ravi Subramanian, delves into the glitzy world of bestsellers and uncovers a risky dalliance between a superstar novelist and his alluring protégé. The Bestseller She Wrote is a combustible cocktail of love, betrayal and redemption. Paperback king, Aditya Kapoor’s life is straight out of a modern man’s fantasy. His literary stardom is perfectly balanced by a loving wife and a spectacular career. With everything he touches turning to gold, Aditya is on a winning streak. Shreya Kaushik is a student with a heart full of ambition. Young, beautiful, and reckless, Shreya speaks her mind and obsessively chases after what she wants. And what she wants is to be a bestselling author. What happens when their worlds collide? Is it possible to love two people at the same time? Can real ambition come in the way of blind passion? Can trust once broken, be regained? Master storyteller Ravi Subramanian, delves into the glitzy world of bestsellers and uncovers a risky dalliance between a superstar novelist and his alluring protégé. The Bestseller She Wrote is a combustible cocktail of love, betrayal and redemption. 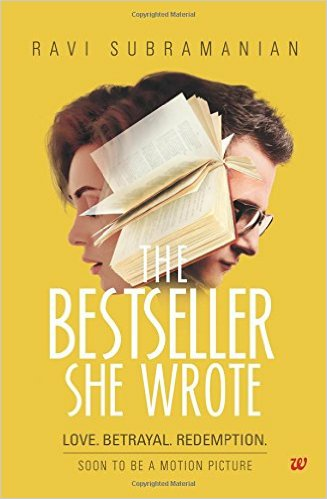 No reviews available for #BestsellerSheWrote, Do you know The Bestseller She Wrote?, Please add your review and spread the good things.